These seem to come in spurts, the albums that somehow made their way into my collection. This is very old, but the record itself is in remarkably good condition, probably because it was purchased for me long after its original release, and long after Shirley Temple was a child star. 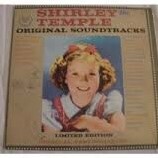 She was about my mother’s age actually and I’d never seen a Shirley Temple movie until much later in life, so I gather that my mother bought this album more for herself and used me as a shill. Whatever the reason, Shirley Temple was a movie icon of the 1930s, a talented little girl who could sing and dance and look like she was enjoying everything she did. In her adult life, she became a U.S. ambassador, and died just this past February at the age of 85. She seems to have been an extraordinarily popular child star, who couldn’t maintain her attraction as she got older and went on to pursue other options as a civil servant, as well as a wife and mother. She has my utmost respect, truly, but this too was a less than inspired workout. I had difficulty exercising to “On the Good Ship Lollipop” and “Animal Crackers in My Soup.” I promise from hereon in, what little we have left will be nothing but rock ‘n roll. And as for that fitness report I owe you, I still owe it.